Dealing with Angela is a real pleasure. We got to meet at a wine and cheese reception and were impressed with the team. Excellent, friendly and always good service in the many years that we have been vacationing here with Paradise Properties. Completely satisfied and will be returning next year. I enjoyed working with the team. The gate security staff was not very friendly. I went for a morning walk, and, as I was leaving the property, was rudely told by the guard that I couldn't walk out the driveway gate. I needed to use the walkout gate, that was farther down. It was difficult to open this gate, and received no assistance at all. Also, the pass system that the community uses can be improved. We've stayed at another property near Venitian Bay. On the property, we were given a swipe card to use to enter the property. A system like this would make getting in much easier. It was a very nice, relaxing place to come back to at the end of along day . Loved the pool. It was a wonderful experience. So glad we stayed here. Overall it was a great experience, the property was beautiful and seemed to be well situated in the area, close to shopping and restaurants. Friendly people stay st Venetian Bay. Property was great,clean,well stocked, home away from home. We will definitely return. Would use paradise properties again, was just disappointed win this particular villa. Very pleasant and easy to work with. Excellent follow up and answering questions. And, we enjoyed your annual wine and cheese gathering. 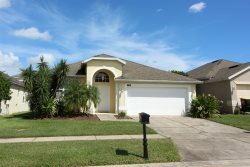 It was very relaxing as well as having the luxury of easy access to restaurants, shopping and activities in the Kissimmee and Orlando area. The property is well appointed and offers one level living with the ample size master bedroom and bath on the first level. We enjoyed our stay in one of your properties and look forward to coming back next year to another one of your properties which we've already booked! It was very nicely decorated. The beds were comfortable and the kitchen was well stocked with items needed to cook meals. The lake view off the back patio was a nice amenity as well as being so close to the community pool. It took only about five minutes to get to the Disney theme parks. We had a great stay! First of all I am so sorry for the delay in filling out this survey (we stayed at the property in August and September 2015). I am Amira, Karim's wife. I was dealing with Angela and she was absolutely wonderful! She always answered our calls or text messages. She was very helpful and supportive and she always managed our requests with friendliness yet professionally and conveyed our requests to management and the maintenance team and 100% of our requests were handled greatly (with a few bumps but end result was satisfactory). Our stay was nice. I had my baby so it was hectic and chaotic. And I would like to apologise for the mess we left behind! Please do sent my apology to the cleaning team. Everything we needed for a great vacation - thank you! Sherry Keast is so personable and friendly. This visit our 5 to Florida of which this was our 4th time with Paradise Properties. It is like having a second home away from home. We feel confident that everything we need will be there. If something would be missing, we know that Sherry Keast will provide it to us as soon as possible. We have no reason to go anywhere else. We plan on continuing our relationship with Paradise Properties for a long time. It was great, loved it, will be back next year. Everything went very smooth, no problems with check-in. Our agent kept us informed or how to enter the property and retrive the info for locating our unit/key. One suggestion: I have some physical issues and a safety grab bar getting into the tub would have been very helpful. Angie was excellent. We had a severe ant problem one day and she was right on it. This property had lots of towels, coasters, dishes, and pans. We really enjoyed the location and everything but the carpet was in decent shape. However, we will never rent another property with a private pool because it is a waste of money to pay more for the property and not be able to use the pool. Management Note: This guest chose not to pay to heat the pool in the winter, even though they were offered a discounted price for their long stay. From my previous comment you can figure out that we had a wonderful time. Since the beginning Angela was very helpful and need to provide information. The company proved to be very reliable and idonea to deliver exactly what sold and very honest to refound a insurance that was not necessary because we already had one who had the same coverage. We were very happy to be staying for two weeks at the residence of the Venetian Bay Condominium. It's a beautiful, wonderful condo. The house is very good, comfortable, well-equipped, safe. We ware marvel at the site, the house certainly has increased our satisfaction with the trip. Certainly we would like to go back another time and were very quiet on display for friends. Angela was very helpful throughout the negotiations, so thanks. To be honest, we all would like to return as soon as possible. Angela was very nice to work with, very friendly. We are currently working with her for return visit next year. Very grateful to the care provided by the staff and Ms. Angela Lozano, really I recommend the property, very nice in every way, my family was very happy at all. Very grateful and really I recommend the property, very nice in every way, my family was very happy at all. I enjoyed working with Angela when I booked the property. She is an asset to your company. The property was located very close to Universal Studios which we appreciated.